As far as I know, there is no record of US Divers two hose regulators in which serial numbers correspond to year of manufacture. But we do know when certain models were made and when production stopped. Also, upgrades and improvements were constantly being added. US Divers changed addresses four different times in less than 10 years. With all this information available, it is possible to narrow down the time frame in which your US Divers two hose regulator was manufactured. 1956-59: 11201 West Pico Blvd. 1960-61: 3323 West Delhi Rd. 1962-ON: 3323 West Warner Ave.
1956: Last year for riveted labels. 1956: Kleer E-Z mouthpiece introduced. 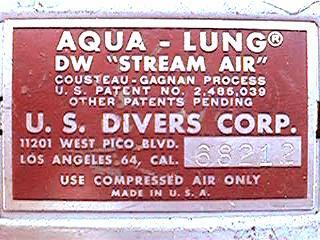 1959: DA Aquamaster with yellow hoses and mouthpiece. 1960: DA still has yellow hoses, but black mouthpiece. 1960: Improved nylon hose clamps introduced. 1964: DA and Royal Aqua-Masters now have shiny chrome. 1966: DA and Royal Aqua-Masters feature new 'tire-like' yoke screw. 1972: The Royal AquaMaster features a new 3000 psi heavy duty yoke and screw. Aqua-Lung 'Trademark', 1951-54. 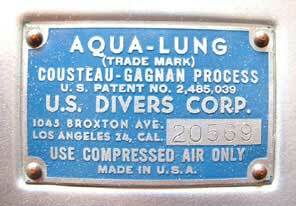 The first US Divers regulators were simply known as 'Aqua-Lung', with the word 'Trade Mark' in parentheses below. They had the '1045 Broxton Ave.' address on them, and a removable exhaust valve housing. There were four different colored labels - the first was black, then red, next green and finally blue. The hoses and mouthpiece were a one piece assembly, with no mouthpiece check valves. DX Over Pressure One Stage, 1954-57. This single stage regulator was probably the second model produced by US Divers, and was the only one that they made with a metal mouthpiece. Inside the mouthpiece was a venturi jet, routed from the first stage orifice via a small green hose. This model used 4 rivets to secure the name plate instead of the tabs that were used on later models. Navy Type DA, 1955-56. Navy Type DA regulators were made to Bureau of Ships stringent specifications. This regulator was very short-lived, probably only made for one or two years. US Divers changed addresses to 11201 West Pico Blvd. DA Navy Approved Two Stage, 1956-58. 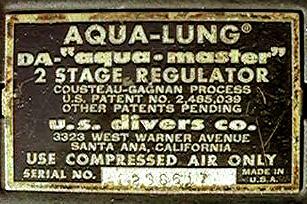 These regulators were predecessors to the DA Aquamaster. These ID plates came in two different colors: blue and orange. They were used extensively by Navy salvage and SEAL teams. Nameplates are secured with tabs. 1957-58 models were equipped with the 'Kleer-EZ' mouthpiece. 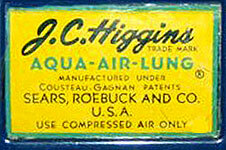 Sears J.C. Higgins Single Stage Aqua-Air-Lung, 1956-58. During this time period, Sears bought one stage regulators from U.S. 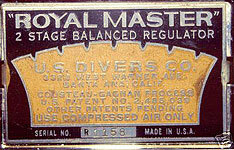 Divers and sold them under the "J.C. Higgins" trade mark. The regulator bodies were from an Over Pressure Breathing model and were painted blue - not chromed. 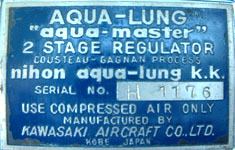 Aqua-Lung Trade Mark Mistral, circa 1958-59. 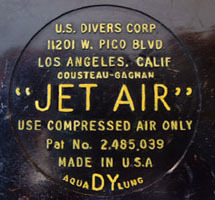 This metal foil decal was apparently used to re-label the Sears J.C. Higgins regulators. I suspect Sears stopped selling the J.C. Higgins regulators, and U.S. Divers re-labeled them for resale, possibly to the Canadian military. Any additional information on this regulator would be appreciated. DW Stream Air One Stage, 1956-57. 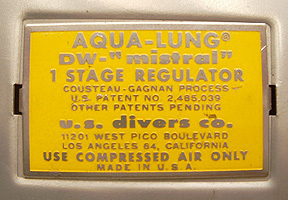 The DW Stream Air single stage regulator was the predecessor to the Mistral, but had what US Divers called "venturi action" for easier breathing. By 1957, the regulator bodies were one piece, no longer having the removable exhaust housing. DW Mistral, 1958-70. 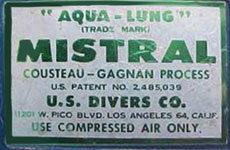 The Mistral was developed and perfected by Captain Jacques Cousteau for use by his diving team. Also used and approved by the French Navy. It was an inexpensive, single stage regulator with yellow nameplate and yellow hoses. DY Jet Air, 1956-63. The Jet Air was the most inexpensive single stage regulator, because of a new housing made of a high impact fiberglass phenolic compound. They appeared in the 1956-57 catalogs, and the phenolic was brown in color. They do not appear in the 1958-60 catalogs, but reappeared in 1961-63. These later models were made of a black cycolac, and had a decal-type label, instead of the raised letters on the earlier models. 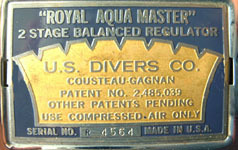 DA Aqua-Master, 1958-72. 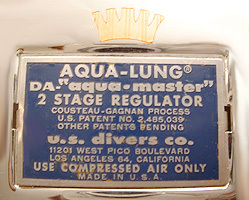 In the first two years, the DA Aqua-Master had yellow hoses, and the nameplates were not serialized. In 1964, they changed from dull chrome to shiny chrome. In 1970, the labels changed from a rectangular plate to a round decal. The DA was probably the most popular two hose regulator ever produced. 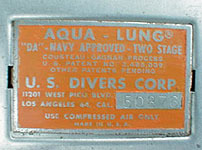 After 15 years of production, US Divers dropped the DA Aqua-Master in 1973. Royal Master, 1964-65. This was US Diver's first two stage, balanced double hose regulator for smoother performance at all tank pressures. This model was only produced for two years, and is rather hard to find today. 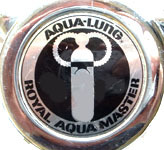 Royal Aqua-Master, 1964-69. 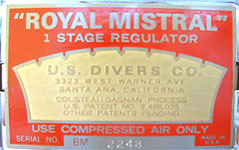 The Royal Aqua-Master two stage balanced regulator was advertised as the 'King of Professional Regulators'. Like the DA Aqua-Master, the labels changed from a rectangular plate to a round decal in 1970. Royal Mistral, 1965-67. This newly designed Mistral had a balanced single stage for effortless breathing at any pressure. They were priced at $65, which was $15 more than the regular Mistral. These were made in small numbers, and are very hard to find today. Royal Aqua-Master, 1970-75. These had a round sticker on the front, denoting either 'Aqua-Master' or 'Royal Aqua-Master'. The serial number was stamped on the back. 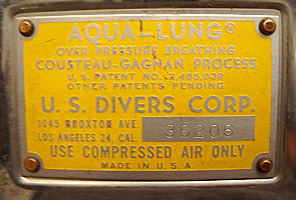 The last US Divers catalog to feature a two hose regulator was 1975. Nihon Aqua-Lung K.K. Aqua-Master. 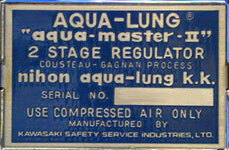 US Divers authorized this Japanese company to build Aqua-Masters in the late 1960's and early 1970's. They were manufactured by the famous Kawasaki Aircraft company. Nihon Aqua-Lung K.K. Aqua-Master II. I believe this is the second model made by Nihon Aqua-Lung of Japan. 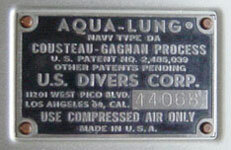 US Navy Anti-Magnetic DA Aqua-Master. This US Divers DA regulator was used by the US Navy UDT and SEAL teams. The entire regulator had a black finish to eliminate glare, and the label was black with brass lettering.